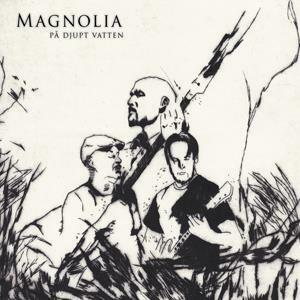 The good people at Rockblog.Bluesspot has posted a nice review of the sixth MAGNOLIA album "På Djupt Vatten". For our deutsche Freunde; click here to check it out! We now have a new FaceBook page! This is combined for all the news of the Record Heaven web shop, and Transubstans Records / sub-labels. The new page can be found here. Go like it for a full coverage of our news!! 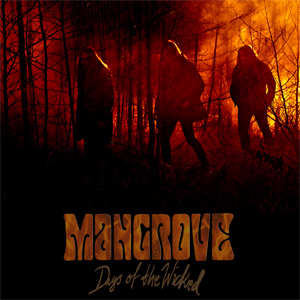 For our German friends; brand new review of MANGROVE's latest effort "Days Of The Wicked". This time written by the good people of DareDevil Records. Click here to read! MAGNOLIA: New album ready for pre-order! Ronny Eriksson's MAGNOLIA is coming back with the sixth (!) studio album "På Djupt Vatten". The CD edition will be released on April 29th, and is now ready for pre-order. More info coming soon about a vinyl edition! MOTHER MISERY: Deadication 12'' finally in stock! 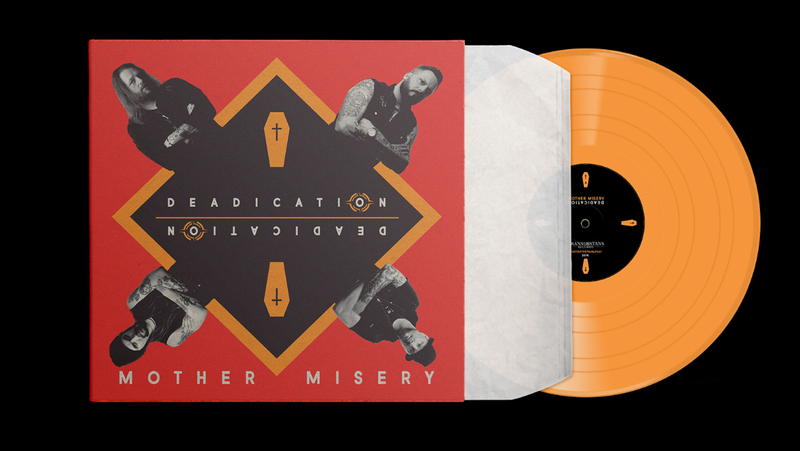 MOTHER MISERY's latest effort "Deadication" is now available on orange 12'' vinyl as well! It is released on March 18 - click here to pre-order! At last! 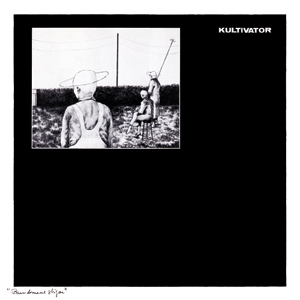 The official Transubstans Records reissue of KULTIVATOR's classic album "Barndomens Stigar" (1981) is finally available! Click here to pre-order it through Record Heaven. 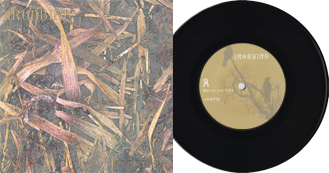 Both available on black vinyl and bronze vinyl! The first review for MANGROVE's coming album "Days Of The Wicked" is written by the good people at RockBlog.BluesSpot and it can be found here. Enjoy! 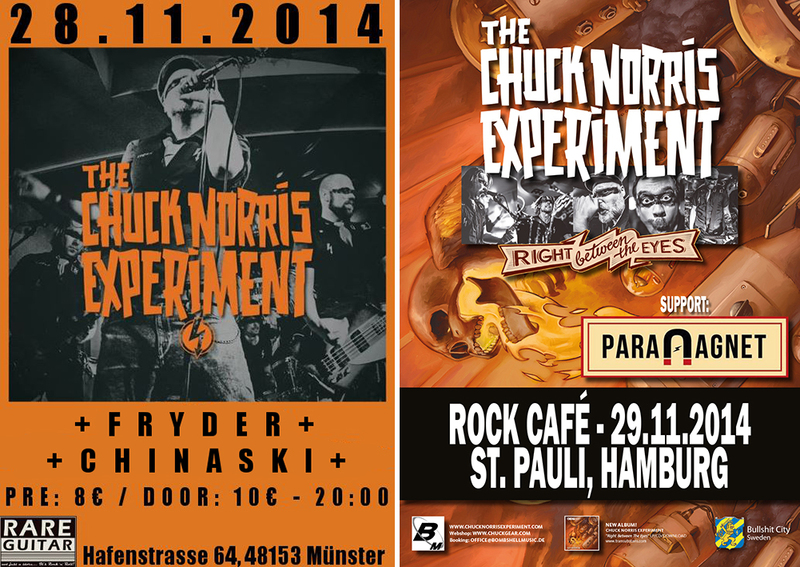 Here we have some new tour dates for our beloved CHUCK NORRIS EXPERIMENT! Do NOT miss out on their energetic live shows if you have a chance to check 'em out - you will not be disappointed! GUDARS SKYMNING: CD out now! 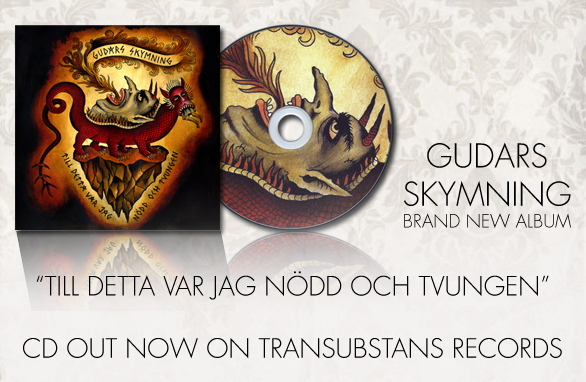 The brand new GUDARS SKYMNING album "Till Detta Var Jag Nödd Och Tvungen" is now out on Transubstans Records! Click here to check out the track "Olycksfågel" from the album. A vinyl version will soon be available for pre-order as well! This one's for our German-speaking friends; nice review by Underdog Fanzine! NEW CD'S READY FOR PRE-ORDER! Two new CD's are in our release queue at the moment! GUDARS SKYMNING 2nd release on Transubstans Records "Till Detta Var Jag Nödd Och Tvungen" (out in February). Also, Transubstans veterans MANGROVE returns with a new album for the first time in over five years! Check the section to the right to pre-order "Days Of The Wicked"! NEW VINYLS ON THE MOVE! At last, you now have the possibility to pre-order a 12'' EP from Mother Misery! Served on orange wax, this very limited baby can be ordered here. Not to be forgotten, the vinyl edition of PONAMERO SUNDOWN's critically acclaimed album "Veddesta" is now in stock and can be ordered here! A lot of kind words are flowing around the internet nowadays, mostly about the thrilling new release from SERPENT, "Nekromant". Check out the reviews from MoreFuzz, Doom Charts and Zware Metalen! Time to post a really nice review from The Burning Beard (formerly knows as Ride With The Devil). Check it out here ! 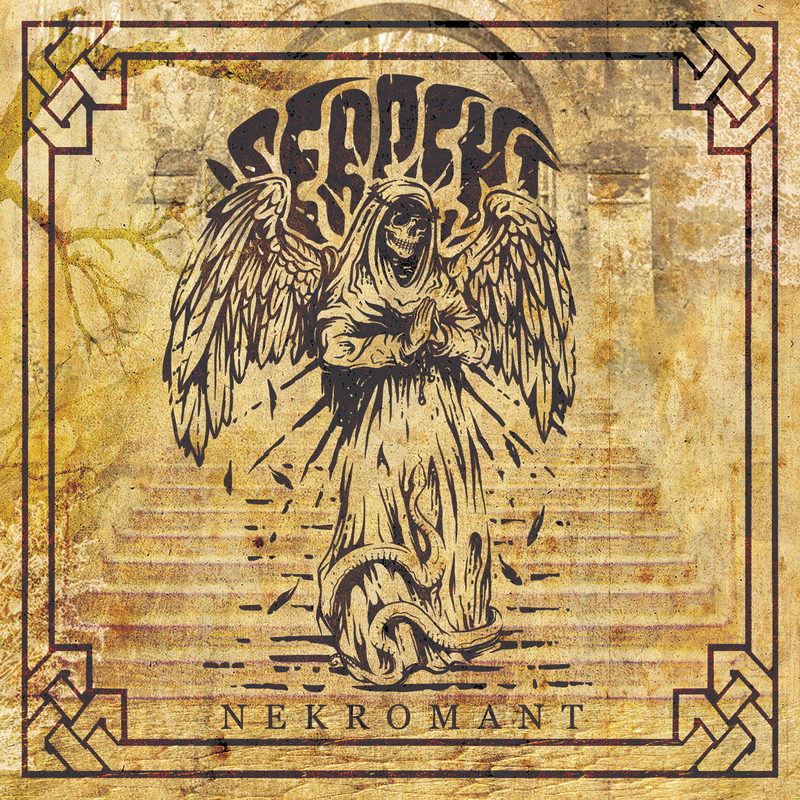 First track "Master Of Ceremony" is now streamed from SERPENT's unbearably heavy debut album "Nekromant". Click here to have a listen! The album will be released on Transubstans Records in December 2015. 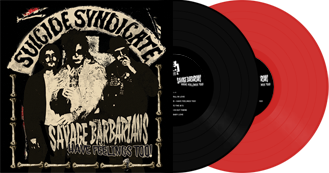 The new Suicide Syndicate album "Savage Barbarians, have feelings too" was supposed to be released on October 30th by Troglodyte Records. Due to personality crises and sonic reduction in the outer layers of outer space causing a ripple in spacetime the release is postponed until January 22nd 2016. See them when they're still alive! Oh, and in the meantime; click here to listen to newly released track "The Truth Is Out There". RIGHT NOW: Transubstans 7'' deal! At the moment we have a very special offer for you guys! For a limited time you can order the ultimate 7' compilation from Transubstans Records! 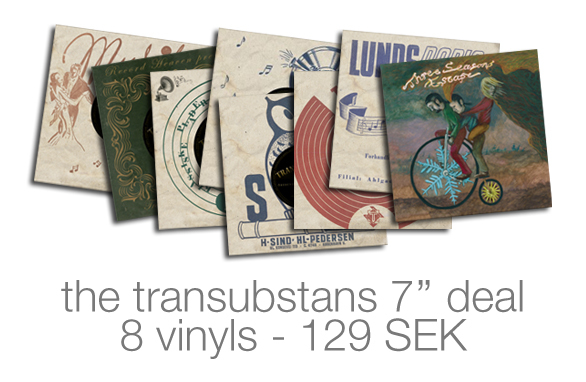 15 bands, 16 tracks on 8 records in various colors for 129 SEK only! Featuring ORESUND SPACE COLLECTIVE, THREE SEASONS, BLACK PYRAMID, ABRAMIS BRAMA, BLACK DEBBATH and many more! Check out the wonderful words about the coming SUICIDE SYNDICATE album "Savage Barbarians - Have Feelings Too!" Written by Carry at New Underground Music. The brand new single "Who Do You Love" is in stock! Order it through Record Heaven today! 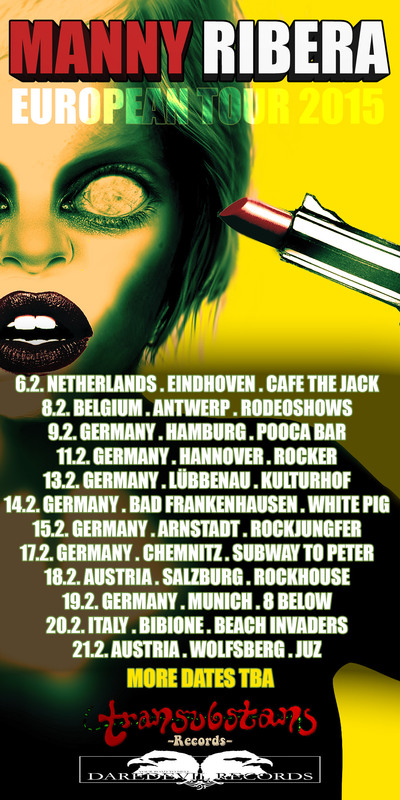 Dec 5, 2015 - The Pitcher, Düsseldorf (DE) w/Iron Wolf + Late acoustic show! what MM were, but what I can say from this is that they are a serious Hard Rocking force with a mighty slam of Metal behind them." The new album "Savage Barbarians... Have Feelings Too!" 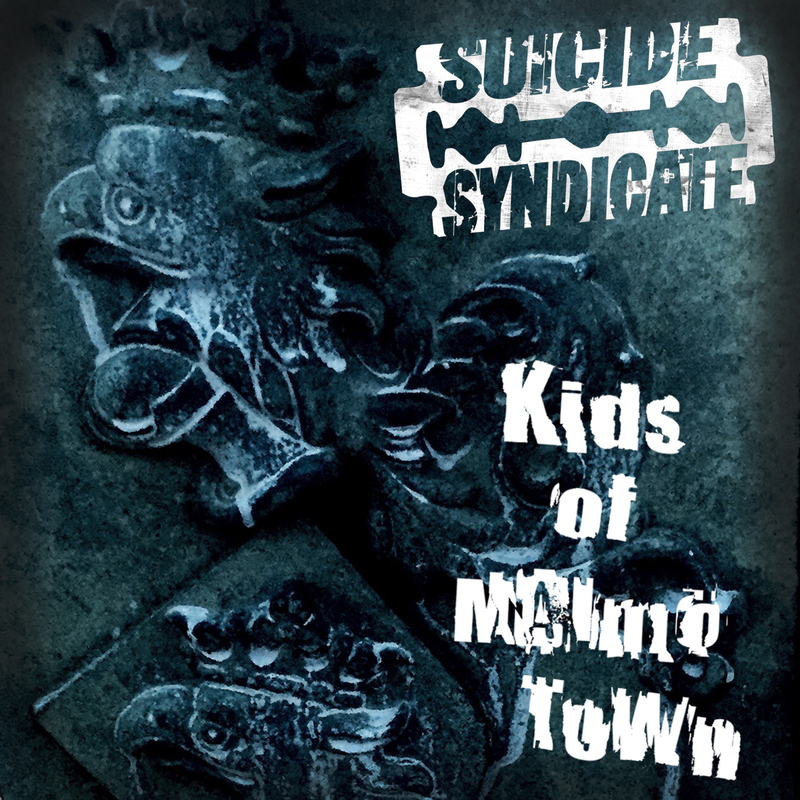 by Malmö punx SUICIDE SYNDICATE is finally available for pre-order! Orders can be placed through Record Heaven. ...sweet review! This time from German online mag FFM-Rock! Click here to read. SUICIDE SYNDICATE: First track out! Finally, the first track from SUICIDE SYNDICATE's coming album "Savage Barbarians... Have Feelings Too!" is released! Click here to enjoy "Kids Of Malmö Town"! Yet another nice review for MAJOR KONG's "Doom Machine". This time from Metal-Temple! New review available for MORGAN ÅGREN's coming solo album "Batterie Deluxe". 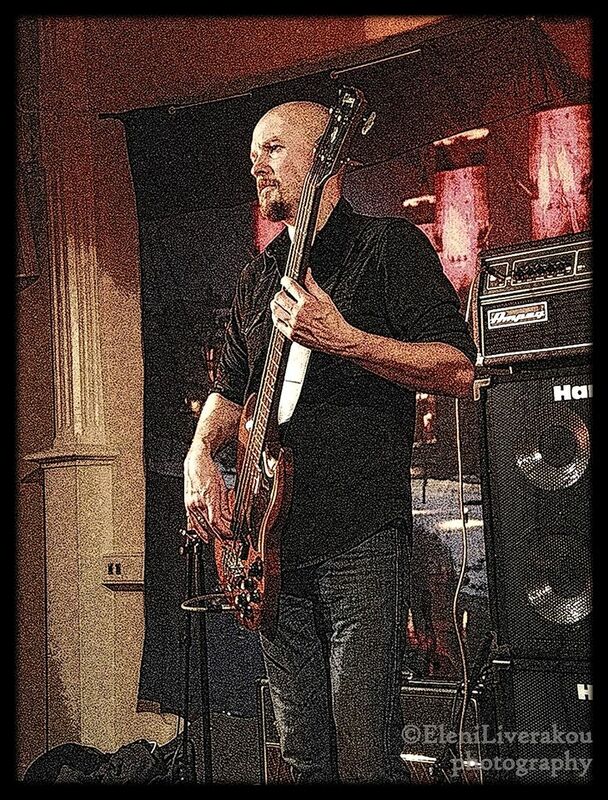 Thanks a lot to Rob of Progressive Music Planet! After some delays, the vinyl version of MAJOR KONG's smashing "Doom Machine" is in stock! These move fast, so be sure to grab a copy while they're still available! New review for MOTHER MISERY's coming EP "Deadication", this time by Ride With The Devil in the UK! Click here to read. Check out the Transubstans newsletter for June! Featuring info about MOTHER MISERY's coming EP "Deadication", label news such as MORGAN ÅGREN and SUICIDE SYNDICATE, and an update on the tour plans of CHUCK NORRIS EXPERIMENT! Newsletter can be found here! First review out for the coming MOTHER MISERY EP "Deadication" Thanks a lot to Carry of New Underground Music! Just got in a few nice reviews for MAGNOLIA's latest masterpiece "Svarta Sagor". Friends, it's been quiet here for a while, but in the background we've got lots of things going on... MOTHER MISERY's "Killing Me" from their coming "Deadication" is now released on Spotify. So is MAGNOLIAS "Omväg" and "Svarta Sagor" from their brand new album. Check it out! 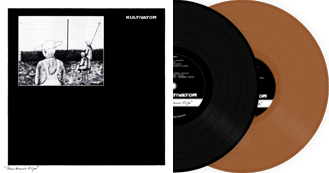 MOTHER MISERY's coming album is also available for pre-order, as well as the coming vinyl version of MAJOR KONG's "Doom Machine", released on black vinyl and halloween orange vinyl! So... yeah, lot's of things going on! ABRAMIS BRAMA returns to the Sweden Rock Festival for the fourth time, and they bring the songs from the latest critically acclaimed album "Enkel Biljett", released in May 2014 through Transubstans Records. "They are somewhat pioneers for the bands right here and now in the 21st century, and the followers are many. 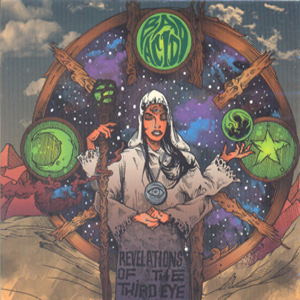 Brilliant songs and lyrics that hits your awareness like a rock". These are the words of Sweden Rock Magazine about "Enkel BIljett", probably ABRAMIS BRAMA's highest praised effort in their entire career. MAGNOLIA: First track from new album streamed! We're proud to give you "Omväg", the first streamed track from Magnolias coming album "Svarta Sagor"! Good ol' Sabbath feeling! "Omväg" will together with the title track be released digitally in late April.  To listen to "Omväg", click the album cover on the right pane. MAGNOLIA: New album available for pre-order! The fifth studio album by MAGNOLIA, "Svarta Sagor" is finally avaialble for pre-order! It will be released by Transubstans Records in the beginning of May. 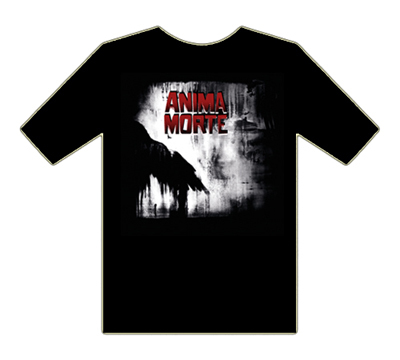 Got a nice parcel last week containing nothing less than ANIMA MORTE T-shirts! Fantastic print of their brand new album "Upon Darkened Stains"! All orders from Record Heaven will be shipped along with a sticker and a pin! Marcos at Metal Temple had a listen to the new Burning Saviours album "Unholy Tales From The North". Click here to see what he's got to say about it! DIRTY PASSION: Self-titled album out on Denomination! 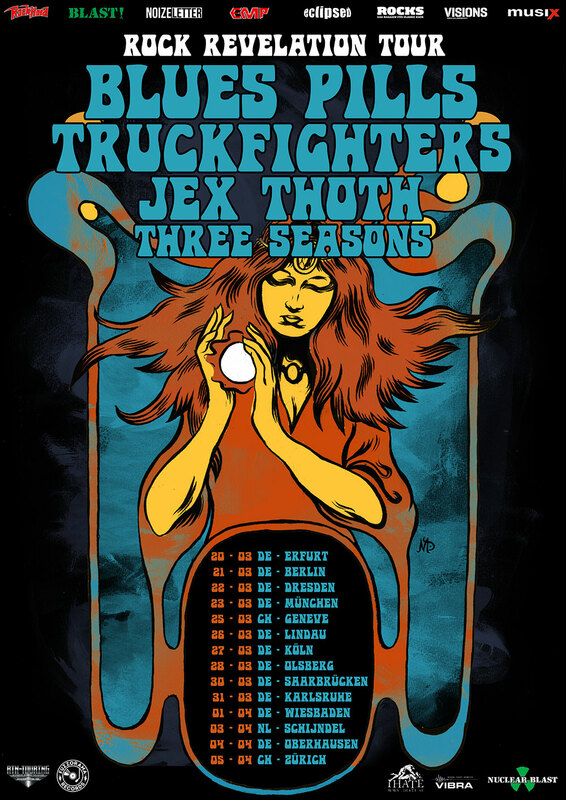 We're happy to let you know that THREE SEASONS will join forces with BLUES PILLS, TRUCKFIGHTERS and JEX THOTH on the German Rock Revelation Tour! The tour will start on the 20th of March in Erfurt, Germany and it ends on the 5th of April in Zürick, Switzerland. 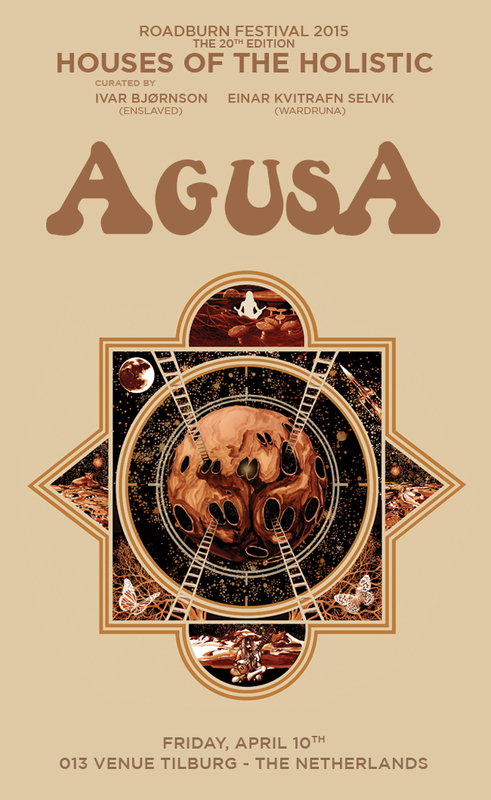 We're pretty psyched about the notice we could read at Roadburn's official homepage a few days ago - AGUSA will perform! Check this concert out if you're a fan of early 70's prog mixed with Scandinavian psych-folk, and of course, a big spoon of kraut..! We have experienced some delay with the new BURNING SAVIOURS album "Unholy Tales From The North". However, the new release date 2015-02-06 is confirmed, and the CD will be in stock by then, so hang in there...! Finally some dates are set for the grand Eurotour of MANNY RIBERA! 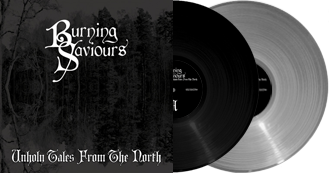 We are very proud to announce that the vinyl edition of the BURNING SAVIOURS album, "Unholy Tales From The North" is now available for pre-order! It will be pressed on both black vinyl and solid grey vinyl! Order it through Record Heaven today! 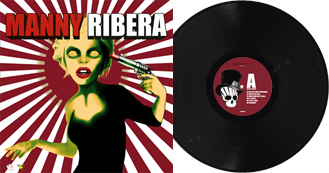 MANNY RIBERA: LP edition in stock! MANNY RIBERA's self-titled debut is now available on wax! Available on black vinyl! 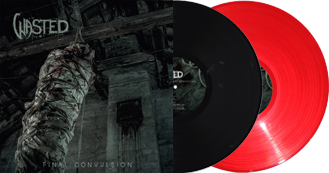 WASTED: "Final Convulsion" in stock! This is unreleased 1985 album from Danish heavy metal masters WASTED - heavier sounds but still in the veins of MERCYFUL FATE & JAGUAR! Be sure to get your copy of this forgotten jewel !! DIRTY PASSION: Pre-order ready ! or simply visit the release page and pre-order through PayPal. 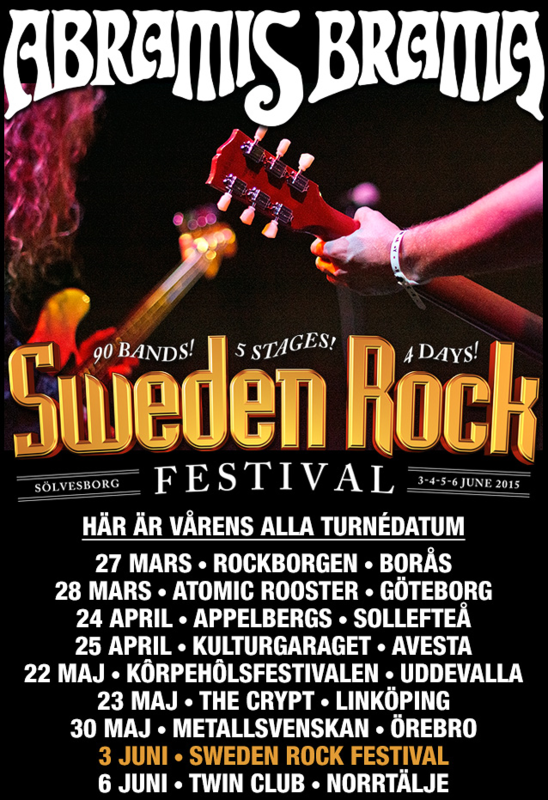 SMALL JACKETS (Italy) are nominated in the band competition for Sweden Rock Festival, 2015! Help them out by clicking here ! Three Seasons third effort "Grow" have been designated the #1 album of 2014 on the Hard Heavy Old Top 100 - list! Big congratulations to you and all the best for 2015! Three Seasons will also perform on the Woodstock Forever Festival in 2015, a German festival with the original retro feeling to it! Pete Pardo of Sea Of Tranquility has established video reviews for YouTube! Check it this link to hear what he has to say about ANIMA MORTE's superb album "Upon Darkened Stains"! The new album by BURNING SAVIOURS, titled "Unholy Tales From The North", is now available for pre-order! You can either order through Record Heaven by clicking here, or you can simply visit the release page here on Transubstans.com and order through PayPal. Anima Morte's third studio album "Upon Darkened Stains" is now available on CD. The LP edition will be available in the middle of December. "Anima Morte heeft me met "Upon Darkness Stains" opnieuw weten te overtuigen van hun kwaliteiten, door een schitterend album af te leveren, dat vol staat met fantastische symfonische rock en een aanrader is voor liefhebbers van dit genre." "I can't recommend this album enough, especially if you enjoy the darker side of progressive rock." The weekend is closing in, the weather is horrible and there's really nothing fun to do. Well, not if you're in Germany anywhere near Münster or Hamburg! New review for SKÅNSKA MORD, this time from Germany! Finally, our newsletter for September is out. Features nice info about LUCIFER WAS, IRONBIRD, SKÅNSKA MORD and TØMRERCLAUS! Record Heaven just bought a mega record collection, consisting of 12.000 records! Check the first part of of our little documentary here! For our French friends: THREE SEASONS will be attending the Celebration Days Festival today - a superb festival for psych, blues and heavy rock! We decided to do a vinyl version of the amazing "Doom For The Black Sun"
by MAJOR KONG, and it's now officially released! Check out some of the reviews ! QOPH, MANNY RIBERA, LUCIFER WAS and MAJOR KONG. New review for Manny Ribera! Welcome to the new home of Transubstans Records!